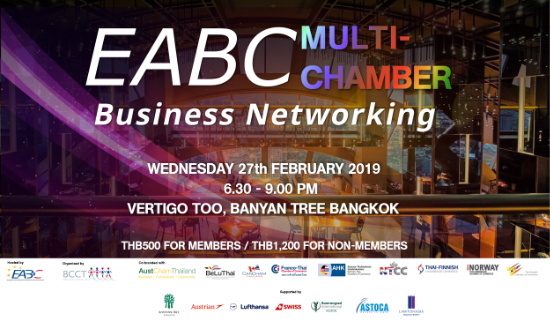 The European Association for Business and Commerce (EABC), together with BCCT, Austcham, BeLuThai, CanCham, FTCC, GTCC, NTCC, TFCC, TNCC, and TSCC, cordially invites you to EABC Multi-Chamber Business Networking on Wednesday 27th February 2019 at Vertigo TOO, Banyan Tree Bangkok. Join us to connect with members from various professions and chambers and enjoy an exceptional experience on the 60th floor of Banyan Tree with the stunning views of Bangkok cityscape and the Chao Phraya River. -THB 1,200 for non-members. NO WALK-INS. Cancellation policy: Please note, if cancelled after 5pm of Tuesday 26th February or in case of no show the total price of the reservation will be charged. BANYAN TREE BANGKOK Situated in the heart of Bangkok within easy access to all the main shopping and entertainment areas, experience world-class service and facilities in the "Land of a Thousand Smiles". With elegant décor and Thai-inspired accents, our 61-floor high vertical resort welcomes you with unparallelled views of the vibrant city and the legendary River of Kings, the Chao Phraya River. Relax in our exquisitely appointed Bangkok 5 star hotel suites, enjoy exclusive privileges at the largest Club and Dinner Lounge in town, indulge yourself in the multiple award-winning luxury spa in Bangkok or savour the mouth-watering culinary delights of our fine-dining establishments offering a variety of ethnic cuisines. Sample evening cocktails at our breathtaking alfresco rooftop restaurant and bar, Vertigo & Moon Bar, experience authentic Thai fare at our signature Thai restaurant Saffron, or treat yourself to a truly unique dining and cultural experience aboard Apsara Dinner Cruise. LUFTHANSA GROUP Network Airlines - The Network Airlines segment comprises Lufthansa German Airlines, SWISS and Austrian Airlines. With their multi-hub strategy, Network Airlines offer their passengers a premium product and a comprehensive route network combined with the highest level of travel flexibility. BUMRUNGRAD INTERNATIONAL HOSPITAL Founded in 1980, Bumrungrad International Hospital is one of the largest private hospitals in Southeast Asia, and one of the most internationally-acclaimed hospitals in the region. Bumrungrad is Asia’s first hospital to be accredited by the US-based Joint Commission International (JCI) in 2002, and re-accredited at each period ever since. In 2017 Bumrungrad became the first hospital in the world outside the USA to receive the Global Healthcare Accreditation (GHA) with Excellence. The laboratory holds a certification from the College of American Pathologists (CAP), also a first for Asia, certifying that its standards of disease pathology is at the same level as leading providers in the USA. Bumrungrad is committed to world-class care, utilizing advanced medical technology along with integrity and compassion. ASTOCA “Assets to Cash” draws on years of experience in the assets disposal industry combining expert knowledge in the major industrial sectors with a working understanding of the Asian and global markets. At ASTOCA, attention to detail, together with unrivalled industry experience, ensures accurate asset valuation and maximum returns for your assets at the lowest cost. Our sale services include live auction sales, negotiated sales, valuation and appraisals and project management. We have a dedicated in-house logistics team who specialise in packing and moving all types of goods of both a personal and larger scale industrial nature. Our logistics team can handle all sizes and types of jobs and have many years of experience moving assets both within Thailand and all over the world. 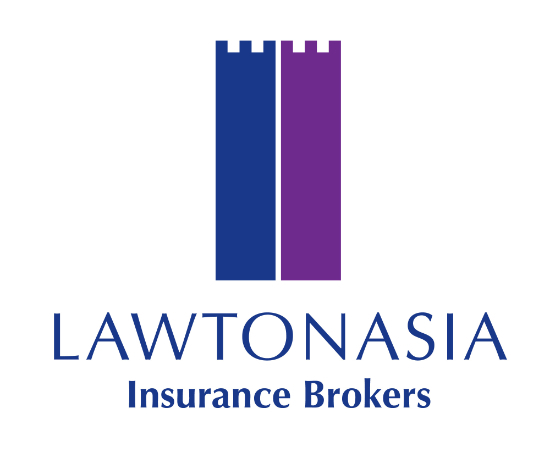 LAWTONASIA is licensed by the Office of Insurance Commission under the Ministry of Finance in Thailand to act as a broker dealing with both General and Life Insurance businesses. We are an independent insurance broking company, which offers transactional and/or advisory services to meet your individual and business insurance requirements. We advise on all types of life and non-life general insurance products. To ensure objectivity and the interests of our clients, we are not tied to any one insurer. This is an EABC Multi-Chamber Event. If you are not a Member of BCCT but you are a Member of the participating chambers including EABC, AustCham, BeLuThai, CanCham, FTCC, GTCC, NTCC, TFCC, TNCC and TSCC, you are applied for a booking at member cost. When completing the Booking Form, please ensure your Name and Email address are correctly entered and state which Chamber you are a member of in the 'Additional Information' box to enable us to confirm your details with our Partner Chambers.